You’ve probably already noticed that you cannot train working breeds with the same dog training methods used with other dogs. No matter what you do, your dog is just too stubborn to obey. Or, you are facing dominant, or aggression problems. This can be corrected. Private Lessons 1 to 1.5 hours long. This dog training program starts with 4 weeks where you will learn to build a working relationship with your dog. Everyone in the family that lives with the dog is welcome to come. 7 Basic commands: voice and Hand Signals – sit, down, come, heel, leave it, drop it, stop. At the end of this course your dog will be able to pass the Canadian Kennel Club’s Good Neighbour Program. This course comes with our ‘All Dog’s Graduate’ guarantee, and lifetime email/phone support. We also offer 2 hour a year training/tune up for the life of the dog. This is a comprehensive full dog training course designed to take your dog or puppy to the next level of advanced. We will work on public access and obedience. We will work on using the dog’s natural high drive to increase obedience. We will also work to control the drive so that your dog doesn’t become dog aggressive or people aggressive as it grows. 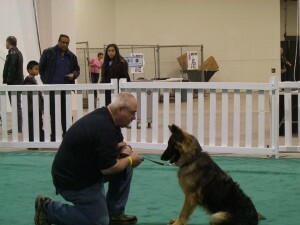 In this course your dog will be working with our trainers and their dogs. We push the limits of their duration and distance. This is a public access course. *within 30 minutes of Aylmer. If you are more than 30 minutes of Aylmer we need to add travel time. *We do not always have time in the evening for ‘in home’ training. It is best if we can come in the day.